2011 was the 400th anniversary of the publication of the King James Version (KJV) of the Bible. This translation of the Christian's special book into the everyday English of its generation was a milestone that opened up a whole new world of possibilities. It led to profound changes in thinking that have shaped the culture of the Western world and left a lasting legacy right up to the present day. The Bible's significant contribution in the fields of literature, art, music, politics, education, morals and the laws of our land cannot be overestimated. This amounts to a compelling educational reason for exploring and celebrating its importance during this anniversary year. 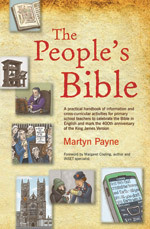 Martyn Payne has written The People's Bible, published by BRF, to help teachers explore the KJV story with primary age children. The Stapleford Centre has created a website Bible4School with an incredible array of resources and information for primary schools. What's the story of the Bible?